Happy National Signing Day everyone! Washington State signed 21 prospects on National Signing Day to go along with the five who had already signed in December and enrolled on campus. Here’s a closer look at the newest Cougars. Led Vista Murrieta to a 32-8 combined record in three seasons. Played mostly running back and had 77 carries for 635 yards and three touchdowns during his senior season despite suffering a shoulder injury. Also a three-year letter winner in track and field who ran the 100m in 10.58 in the CIF state track finals as a junior. Set a personal best of 10.54 in the 100m his junior year. Missed his senior season due to a torn ACL, but helped Mater Dei to a 10-3 record and No. 17 national ranking his junior year, finishing with 59 tackles, 19 tackles for a loss, 20 quarterback hurries, three pass deflections, and two forced fumbles that includes a strip-six, and a pick-six in 2015. Signed with WSU out of high school in 2015 but was a non-qualifier academically. Played two seasons at Holmes (Miss.) Community College and helped his team to an All-Mississippi Association of Community and Junior College programs championship in 2015. Had 25 tackles and two interceptions, including a pick-six, and also contributed four pass breakups. Named a 5A All-State second-team in Tampa, Fla. after his senior season at Jesuit High School. Caught 22 passes for 592 yards and nine touchdowns while rushing for 250 yards and two touchdowns. Also played on defense, recording 41 tackles and three interceptions. From Rancho Santa Margarita, Calif, where he played three seasons at Tesoro High, starting out as a receiver before moving to defensive end. At Orange Coast College, Hendry finished his sophomore season with 30 tackles, 6 tackles-for-loss and 3 sacks and was a second team all-conference selection. Originally from Cedar Rapids, Iowa, Hobbs played one season of prep school ball at Deerfield Academy in Mass. Kuzmack is rated the top prospect in Idaho by ESPN.com. He finished his senior year at Eagle HS as a 5A All-State First Team and All-Southern Idaho Conference first-team selection. Also lettered in track, placing third in the shotput (56-1.75) and fourth in the discus (164-8) during his junior year at the 5A State Track and Field Meet. Ranked the No. 99 offensive tackle in the country and No. 15 in the West by Scout.com. Was an All-Desert Sun second-team selection after recording 26 tackles, two interceptions and four pass breakups his senior year. Also played receiver and caught 17 passes including seven touchdowns. Helped Palm Springs HS to a CIF title during his sophomore year. Lee is rated a three-star prospect by ESPN.com, Scout.com and 247Sports.com. Love enrolled at WSU in January and will join the Cougars for spring football. He missed the 2015 senior season with an injury, but as a junior, he had 28 tackles and one pick, and was also a threat on offense, rushing for 341 yards and nine touchdowns and catching 21 passes for 375 yards and four touchdowns. Rated a three-star prospect by ESPN.com, Rivals.com and Scout.com. 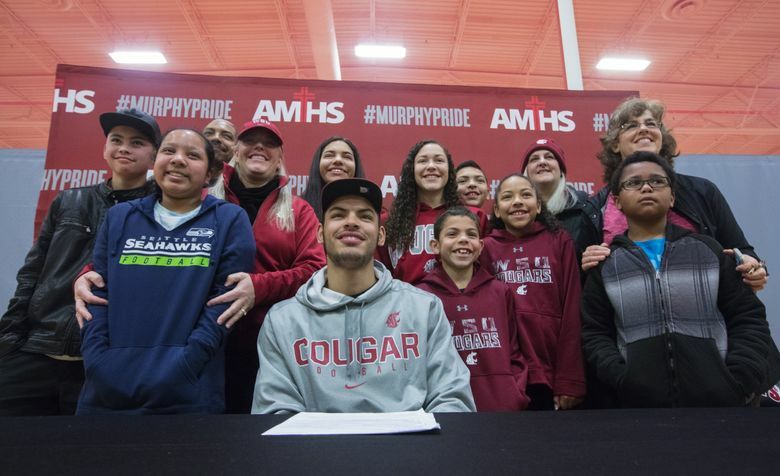 The Cougars held off a late challenge from Cal to sign Lucas, who won a state championship with Archbishop Murphy last season. Lucas played both ways in high school, finishing his senior season with 31 tackles, including 15 sacks. He’s rated the No. 52 offensive tackle nationally, and the eighth-best in Washington by ESPN.com. WSU quarterbacking great Alex Brink likens Martin to former Cougars receiver Dom Williams in terms of his length and athletic ability. Named 4A All-State first-team after his senior year by the Louisiana Coaches Association. Martin caught 45 passes for 751 yards and eight touchdowns while rushing for 493 yards and five touchdowns. Also made 36 tackles and two interceptions on defense. Rated No. 32 prospect in Louisiana by ESPN.com. Dual-sport athlete who played football and basketball at Kailua High. Mejia was a two-time first-team All-State selection and was named to USA Today’s All-USA Hawaii First Team on defense while earning Cover2 Iron Man of the Year honors after playing defensive end and tight end. High school teammates with current Cougar offensive lineman Nilsson Gaisoa…ranked the No. 14 prospect in Hawaii by 247Sports.com and No. 24 defensive end in the West by Scout.com. Made the 6A All-Arizona First Team as a senior, and was selected to play in the Blue-Grey High School All-American Game. Also earned Offensive Line MVP honors at the Oakland Opening Regional in 2016. Ranked the No. 67 offensive tackle in the country and second-best tackle in Arizona by Scout.com, was also named to the West 150 by Scout.com. Amassed 2,756 yards with 35 touchdowns and 10 interceptions in 10 games his senior year, completing 59.5 percent of his passes, and averaging 275.6 passing yards per game. Neville also rushed for seven touchdowns. He’s rated a four-star prospect by ESPN.com and Scout.com, and named to the ESPN300 and is rated the the ninth-best dual-threat quarterback in the country by ESPN.com. Compact speedster who excelled at both football and track and field, and won a 1A state title in the 100m last year. Perry’s personal best in the 100m is 10.76, and his speed shows on the football field, where he was named Cascade Conference Co-Offensive MVP in 2016, rushing for 1,220 yards on 106 carries and 19 touchdowns. Perry is a 2017 Seattle Times White Chip prospect. Mele: “He’s the speedster from King’s High School. He’s a track guy who’s gonna probably win the state 100-meter title again — he’s shooting for 10.5, that’s his goal. Rodgers started his high school career at Arthur Hill High in Saginaw, Mich, but transferred to Valor Christian in Colorado for his senior season because he wanted to test himself against better competition. The nephew of former NBA star Jason Richardson, Rodgers played both basketball and football in high school. He helped Valor Christian to a 11-3 record and 5A State Title as a senior and was named an All-State second-team selection after making 41 tackles with 15.5 for loss including 11 sacks and one pass break up. Grinch: “We’d be naïve to suggest that he’d be coming out here if not for coach (Roy) Manning. It’s good to have connections. He’s from Michigan, did his senior year of high school in Colorado with family. He was really a basketball kid for the bulk of his high school career, and came on late. He has size potential and athleticism and we’re certainly excited about him. Sanders was the final WSU recruit to sign his letter of intent on Signing Day, inking his paperwork in a signing ceremony at his high school at 2:30 p.m. Sanders played quarterback in high school, completing 54 percent of his passes for 1,298 yards and 15 touchdowns last season. But he also amassed 146 rushing yards and had 21 total tackles on defense, including four for loss. He was a 2017 Seattle Times Red Chip prospect. Scout.com National Recruiting Analyst Brandon Huffman: He’s gonna be a really good college players because he’s been playing out of his position at River Ridge, they have him at quarterback. And he’s probably gonna grow bigger. He has his best football ahead of him. Played receiver in high school but will switch to defense at WSU, where the Cougars hope to use him at linebacker. As a senior at Patrick Henry High, recorded 1,230 all-purpose yards and 13 touchdowns, made 22 tackles, six pass breakups and blocked one field goal in eight games of action. High school teammates with current Cougar wideout Dezmon Patmon. Rated a two-star prospect as a wide receiver by Rivals.com and Scout.com. One of the most sought after prospects in WSU’s 2017 recruiting class. Talbott was rated the fourth-best safety in California by Scout.com, ranked the No. 29 safety nationally by ESPN.com. Amassed 49 tackles, two interceptions and six pass breakups as a senior and was named to the All-State third team. Two sport star who also had a Division I scholarship offer in basketball. As a senior, was named AA All-State honorable mention and 3-AA All-Region First Team as a defensive back. He’s rated a two-star prospect by 247Sports.com and Rivals.com. One of WSU’s four-star signees, Valencia played two seasons at City College of San Francisco for coach Jimmy Collins and was named to the Northern California National Division All-Bay 6 League First Team after his sophomore season. He’s teammates with current Cougars Anthony Gordon and Robert Taylor and was ranked the No. 11 junior college tackle in the country by ESPN.com. He will have two years to play two seasons. Enrolled in January, 2017 and will participate in spring practice. White graduated high school early and enrolled at WSU in January. He finished at Miami Central High School in Miami, Fla, but also played at Hialeah American High School as a junior. He’s rated a four-star prospect by ESPN.com and Rivals.com and is ranked the No. 6 athlete in Florida by Scout.com. An under-the-radar prospect who has the potential to make an immediate impact in a depleted WSU receiving corps. He played alongside Valencia at City College of San Franciso, and as a sophomore was named to the Northern California National Division All-Bay 6 League First Team after leading team with 71 receptions for 1,171 yards and 12 touchdowns. Winston led all CCAA receivers in receiving yards and was second in touchdown catches while averaging a CCAA-best 106.5 yards-per-game and 16.2 yards-per-catch. Will have three years to play two seasons. He enrolled at WSU in January and will participate in spring drills.